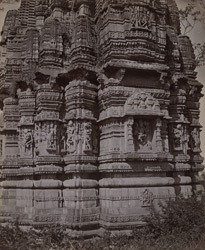 Photograph of the of the base of the rear of the shikara of the Jain Mokalji Temple at Chittaurgarh, taken by O.S. Baudesson in 1882. The fort of Chitor came under the rule of the Pratiharas and other dynasties from the seventh century. Many Hindu and Jain temples from this and later periods are preserved inside the fort like the example shown in this photograph. The oldest palace structures in the fort date to the rule of Rana Kumbha of Chitor (r. 1433-68). Chitorgarh in the modern-day state of Rajasthan was an important Rajput fortress throughout the medieval period. It served as a political capital, despite being sacked by both Ala-u'd-din Khalji in 1303 and Bahadur Shah of Gujarat in 1535, until it was finally taken by the Mughal emperor Akbar in 1567. It was later returned to Rajput control but never regained such prominence again. H.B.W. Garrick described this temple in his Report of 1883-84, "Amongst the temples on the Chitor Rock, perhaps the most excellent examples are those called Makal-ji-ke-mendar in the precinct of the Pillar of Victory...The general plan is a large hall forming the body of the building, to the east of which is a small, square, cell-like, dark chamber; ...[The] spire is...much broken...The temple of Mokal at Chitor is full of carvings...by far the finest sculptures...are sixteen bas-reliefs carved on octagonal bands of the eastern pair of pillars which support the domed ceiling of the Mahamandapa or great hall..."